Portable speed sign format; easy to fit and move around. Portable speed signs are popular with local councils and community speed watch organisations where there is a need to move a SID display with the minimum of fuss or hassle. Based around an entirely new universal mounting bracket these portable speed signs now simply drop into position and lift out ready to be moved. 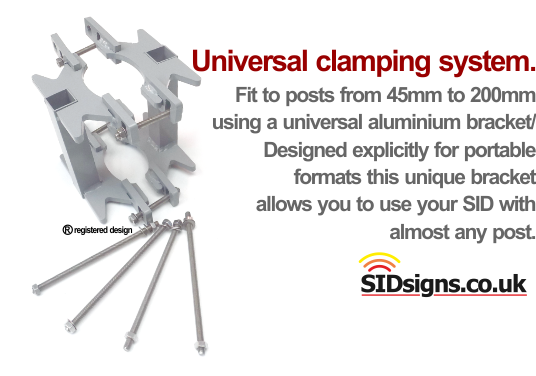 Designed to fit onto posts from 50mm to 200mm the universal bracket is the key to true portability. As you would expect portable speed signs are made from welded aluminium with even the bracket making use of this strong yet light metal. Portable speed signs are designed in two parts; the first part is the actual sign. A self contained unit which operates from 12v DC power this unit has test buttons and USB ports already built in. There are no doors or access hatches as everything is accessable from a recessed command "bar" tucked into the underside of the casework. The sign part drops onto the front of the mounting bracket; special ears on the mounting assembly locate the sign assembly properly into the bracket. The second part of a portable speed sign system is the power pack. Fitted to the rear of the mounting bracket the power pack delivers 12v DC power to the sign via a quick release electrical connector. Lithium ION with solar panels. For applications like speed watch where the speed sign will be taken down at the end of the day the smallest, most compact power option is Lithium ION without solar panels. Housed in a small aluminium "bird box" a 20amp hour lithium ION battery delivers power to the sign. If you want more power reserves a second LiON battery can be fitted and run in parallel. For most other portable speed sign applications adding solar panels can be beneficial; if your speed display is staying put for a while the additional power from solar sources can make a big difference. In this instance you can choose from a lithium battery with solar panels or a sealed lead acid battery with solar panels. Both types of power pack allow you to run up to 40amps of battery power, 40 watts of solar power. 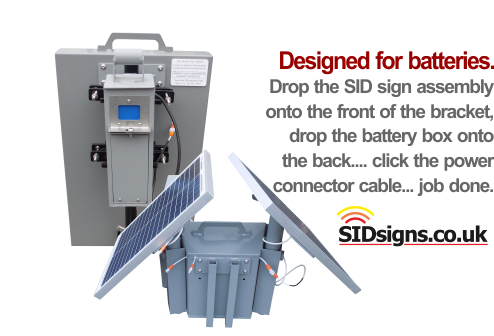 Tripods and trolleys designed to partner these portable sid signs are available. About your SID sign warranty.